As the oldest silk village in Vietnam, Van Phuc has a glorious past. Generations of master weavers have built the village into a national brand. Van Phuc Silk was highly sought after and in the old days was widely favored by courtiers and even monarchs. It became known internationally when in 1931 The King chose to send its silk to a fair in Marseille, to be presented before the French public. It was a great success. The French customers praised it as the best of its kind in Indochina. The thousand-year-old village has certainly changed a lot. Modernization seeps into every household, easing the life of its occupants. But one thing hasn’t changed. Walking along the streets, one could spot a multitude of color and vignettes, now adorning modern glass-front shops and mannequins. The village has still kept their trade, expanding it to suit the needs of modern customers. More modern silk products are sold alongside more traditional ones like Ao Dai (Vietnamese Traditional Long Slit Dress). Van Phuc Silk is soft, light and cool. 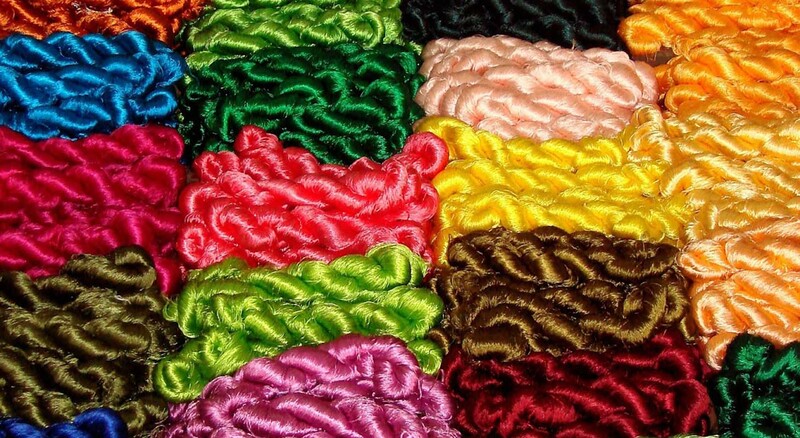 There are over 70 types of silk. They come in all colors and patterns. The patterns are designed to represent Vietnam’s religious belief and culture, things Vietnamese feel close to and identify with, often falling into four categories: animals, plants, items, and ideograms. For example, the animals depicted on the silk are the Four Holy Beasts: the Dragon, the Qilin, the Turtle and the Phoenix. The plants can be apricot blossom, lemon blossom, peach blossom, etc. These patterns have been passed on for a thousand years. Many techniques were at one time lost, but rediscovered by dedicated artists. They went from doors to doors to ask for scraps of old silk to imitate. One of the most important techniques restored this way was Van Silk, Van Phuc’s unique type of silk. Unlike others, Van Silk has two patterns embedded into its fabric. The outer pattern is easy to see, sleek and seems to pop out from the material. The second pattern, however, can only be seen upon closer inspection under the light. This type of silk is available at the workshop of artist Trieu Van Mao, who spent his life rebuilding his ancestor’s art. Not far from the village’s entrance, a gallery proudly stands. Inside visitors are guided through the process of traditional silk weaving. They can admire the traditional goods displayed there. It also houses one of the few traditional weaving machines from the 19th century, now that they have been replaced by electricity-powered machines. The villagers are friendly and more than willing to give a tour of their workshops. There you could actually watch silk weaving machines in action. Large and noisy beasts they are. Standing inside a cramped room where two such machines were clacking away in full cycle, I had a short interview with the owner, who enlightened me on the mechanics behind them. Van Phuc Pagoda and Van Phuc Temple are the perfect places to end one’s tour, built a thousand year ago in honor of the woman who had taught the silk trade to the villagers. Unlike the village that holds them, they haven’t changed much. One can still spot many defining characteristics of an ancient Northern Vietnamese Village: lotus lake and stone wells, small wooden bridges and altars that are carved into stones. Strolling around, one could enjoy the calm reverent silence or simply lay their heads against the ancient beards of banyan trees.